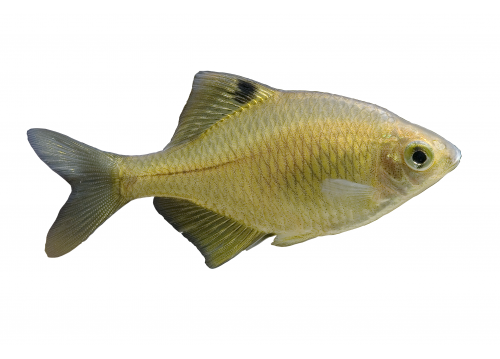 Rhodeus ocellatus is a small fresh-water fish belonging to the family Cyprinidae (carp) and genus Rhodeus. Females are approximately 40-50mm long and males range from 50-80mm. Their bodies are flat with an argent-colored luster. However, males change to a reddish or sometimes purple color during the spawning season (March to September) which functions to attract females. This reddish color is similar to the color of a red rose, which is why it is called a Rosy Bitterling. Every female has a unique pipe about the same length as its own body that is used for laying eggs on a mussel. Usually 2-3 eggs are laid at once and placed at the gill of the mussel. A male spawns into the gill cavity of the mussels right after a female lays eggs to ensure fertilization. Normally a female lays eggs repeatedly at 6-9 day intervals and about 10 times in a season. Eggs grow in the mussel gill and juveniles stay inside of the mussel for approximately 15~30 days after fertilization. Eggs hatch after about 3 days when juveniles are about 2.8mm long. The body has a unique shape resembling the bud of a mushroom. Juveniles swim out of the mussel from the margin of the excurrent siphon. At this point, juveniles are about 7.5mm long and about the same shape as adults. Usually juveniles grow around 40–50mm within one year at which point they become adults. This fish live for approximately 3 years and rarely exceed this lifespan.